Sadiq Khan is getting a lot of mileage out of being the son of a bus driver. If working class had such cache here I’d enter every room announcing myself as the daughter of an electrician. Who knew plebeian was the new status symbol in liberal politics!? Everybody was so excited here because the first no-kill animal shelter was opening up. Animal lovers tend to keep found animals or relinquish them to small home-based rescue operations rather than hand them to the main shelter that euthanizes 70,000 a year. Now a rescue pal tells me that according to her vet the new shelter is only technically no-kill & will outsource the animals to be euthanized. It’s likely many will still end up as victims of experimentation in medical & veterinary schools. Such a disappointment after such excitement! In the dog park, I met someone from the new shelter who wants to help adopt out my little ones. I was so excited at first but didn’t know about that outsourcing thing so now am going all micromanaging about by whom & how they get adopted. I told her little Daisy is needy as all get-out & wants constant attention so needs caretakers who are home like retirees or home-based workers. She suggested a couple who are both doctors which means they’ll be gone all day & Daisy will be left alone grieving & bereft. No way. You rescue animals because you want them to be happy, not just properly fed. There have recently been several analyses of Democratic Party voting patterns–all reporting growing liberalization. That’s no great revelation but vetting the methodology used would be essential here: who were they polling? what were the issues they asked about? where did they find people who identify with the DP? Because the DP isn’t really a membership organization; it’s an electoral apparatus that puts forth candidates who others vote for. Those voters do not meet to democratically decide the politics or the candidates of the DP; that’s all done by an elite behind closed doors with a retinue of hacks & hangers-on as enforcers. The elite Democratic Party leadership recently warned Sanders’ supporters against making any unseemly displays of outrage when the superdelegates come swooping in from outer space at the July convention to name Clinton the nominee. They’ve been put on notice to “behave.” Or what? The leadership will call the cops? Give them a stern talking to? Give them the naughty finger & a spanking? What kind of political relationship does the leadership have with its constituents? It certainly can’t be called democratic. To counter the obvious contradiction between Sanders’ massive rallies & the handful of elite, unelected superdelegates, Clinton is insisting that rallies do not translate into electoral victory. Not in a rigged system they sure don’t. That the electoral game is rigged & controlled by an unelected elite is no surprise to anyone not fumbling with delusions. That progressives continue to believe the DP plays, or has the potential to play (by being pushed to the left), a role in social progress is the central conundrum of US politics. In the DP world of realpolitik, such delusions are the child’s play of politics. But in the world of social movements, they’re political dead-ends. Working people are way ahead of progressives on the DP & in their majority do not participate in the electoral scam. Democratic enfranchisement is an achievement of the great democratic revolutions that overthrew feudalism & brought in capitalist rule. Winning the vote for women, Blacks, & others denied it was a major advance. But it should not be wasted on two-bit hustlers or be fetishized & used as the bellwether of social transformation. 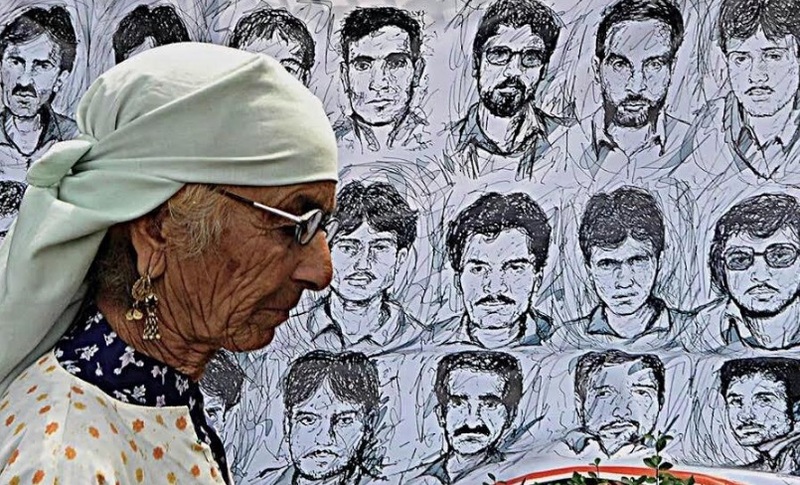 Such a powerful photo of a protesting mother in Kashmir in front of a photo montage of those disappeared by the Indian military. Losing a beloved to disappearance or violence of any kind is not a wound that heals with time. Disappearing people is an absolutely monstrous crime against the victim, his/her family & friends, & humanity as a whole. Disappearing seems to be a primary weapon of repression under neoliberalism, the barbaric phase of capitalism, & is practiced in nearly 50 countries. In every one of them, these photo montages are created to show how personal this crime against humanity is felt. 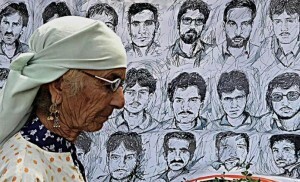 These montages will be displayed till justice is attained–a mission yet to be achieved anywhere. In some countries they have been displayed for decades. Our deepest condolences to the families & our fullest solidarity with their work to end this unspeakable & barbaric practice. London’s new mayor Sadiq Khan is turning out to be a real loser. He staunchly opposes BDS & supports Israel but he’s also something of a dope who’s vowed to help Clinton defeat Drumpf. By getting all the people in England to vote for her? He’s rip-snorting mad because Drumpf’s proposed ban on Muslims entering the US would prevent his two teenage daughters from visiting Disneyland. The Syrian refugee crisis must have gone right over his head if that’s his chief objection. He also would “love” to see Clinton win because he cannot imagine a better role model for his 14 & 16-year-old girls. No one is a better role model than a war-monger who grovels & shills for power & whose highest achievement was turning Haiti into a sweatshop haven? With such a stunted imagination he makes a perfect complement to Cameron & Betty. Was our man Khan London’s answer to lesser evil?